Can psychotherapy really be offered online, without seeing or hearing the other person? Is rapport possible? What does the therapeutic conversation look like? These are increasingly topical questions as therapists explore the affordances of the internet and email. In this fascinating guest blog, Stuart Ekberg introduces us to the world of digital therapy in his report on on the article in the new issue of ROLSI that he wrote with Alison R. G. Shaw, David S. Kessler, Alice Malpass & Rebecca K. Barnes. Talk is supposed to be central to psychotherapy – so much so that therapy has been described as ‘the talking cure’ since the 1890s. However central, this basic format has not been immune from digital disruption. In our research, we’ve explored a particular type of online psychotherapy that gets delivered in a text-based ‘chat room’. We were interested to know how psychotherapists and their clients could engage in psychotherapy in an online setting where they couldn’t see or hear one another. We found the process answering this question almost as interesting as the answer itself. Fresh from my doctoral studies, I was used to long periods of fieldwork to collect data. However, on my very first day working at the University of Bristol, I began analysing 151 sessions of online psychotherapy. I would later be given access to a further 1,128 sessions. To put it another way, the 1,100 or so hours of social interaction our team was studying contained approximately 1.5 million words. When I checked, no other ROLSI study published in the past decade has reported analysing this much data. A study of this magnitude was possible because my Bristol colleagues had the foresight to collect these data as part of a randomised trial. Although this trial established that clients receiving online psychotherapy report reductions in mental distress, the researchers knew that this trial didn’t address the actual process through which online psychotherapy gets delivered. For this (as Stommel and te Molder, 2015, did for phone counseling), they turned to conversation analysis. Never before have I been involved in a project that has achieved so much in a short space of time ( – and perhaps I never will again). Across a 15 month period we managed to get across all that data. This was partly because the data was already collected. Being text-based online interaction, we also didn’t need to do any transcription – the participants had already done this for us through their interaction with one another. Even with our shortcuts past some usually time-consuming parts of conversation analytic research, the sheer amount of data we were working with meant an intense 15 months of analysis. This is why we started out working with a subset of 151 therapy sessions, moving on to the full corpus only after we’d built an initial collection and developed a candidate analysis. On the basis of this initial work, we were able to develop a search strategy – described in our ROLSI article – to expand our collection using the full 1,279 sessions at our disposal. Our analysis showed that even in a context where therapists cannot see or hear their clients, they manage to make orientations to clients’ emotional experiences. We show how they design these orientations in orderly ways. Sometimes clients describe a particular circumstance and then clearly articulate a current, personal, and negative emotional impact of that circumstance. In this context, therapists’ orientations to emotion were usually commiserations (e.g. “I’m sorry to hear that”). If clients didn’t highlight a current emotional impact, therapists could still orient to emotion, but tended to do so with an alternative practice to commiseration. In addition to orderly design features, our research also highlights how the text-based medium of online therapy can shape the delivery of orientations to emotion. In these therapy chat rooms, participants privately compose their posts before sending them. This means that therapists can design multi-action turns that would be difficult to accomplish in face-to-face therapy. This enables therapists to combine orientations to emotion with attempts to move the discussion in a particular direction – often away from sustained discussion of emotion. Our research was therefore able to identify not only how orientations to emotion are possible in online text-based therapy, and also how this medium can shape these orientations. We think our article contributes more to conversation analysis than an exploration of how psychotherapy is accomplished online. It also highlights the payoffs of working with other types of researchers, such as clinical triallists, who may be collecting interactional data in the course of answering their own research questions. For those with an interest in this area, this will be one of the themes of the next International Meeting on Conversation Analysis and Clinical Encounters, which will be hosted by the University of Bristol in 2017. Through our experience of collaboration, we have achieved much more than I previously would have thought possible. Stommel, W., & te Molder, H. (2015). Counseling Online and Over the Phone: When Preclosing Questions Fail as a Closing Device. 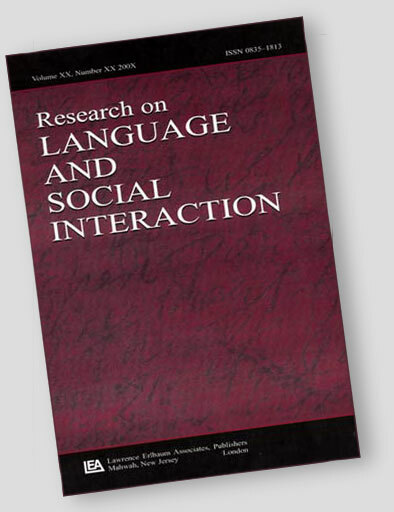 Research on language and social interaction, 48(3), 281-300.